Mainland tourists board a bus in Tuen Mun as protesters make their feelings known. 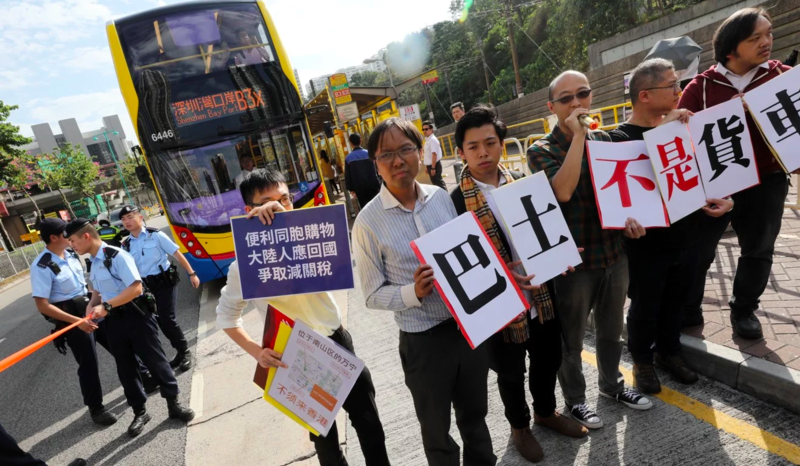 A group of activists staged a protest against mainland Chinese shoppers on Sunday in a town near Hong Kong's western border, in the latest of a new wave of anti-mainland sentiment that has spread across the city. The protest came on the day before Lunar New Year's Eve, when many Chinese families go on a shopping spree ahead one of their most important festivals. On Sunday, busloads of mainland visitors kept arriving and leaving Tuen Mun, a town about 20 minutes drive from the Shenzhen Bay border crossing. A group of 10 activists gathered at the cross-border bus terminus and urged the tourists to buy new year necessities at home instead. "Please stop coming to Hong Kong any more. You should go back and strive for better food safety and lower import tariffs," urged the activists from Population Policy Concern Group, and community-based Tuen Mun Siu Tsui Concern Group, and Tuen Mun Community Network. Lance Yan Pui-lam, the spokesman for Siu Tsui, said he had been living in Tuen Mun for more than 30 years and witnessed how the influx of mainland shoppers made the town overcrowded, and lead to skyrocketing rents and forcing small businesses out of the area. "They have brought very serious nuisance to the whole community," Yan said. "Only the landlords and businesses benefit from the rising number of tourists. Common people cannot share the benefits but have to bear the negative consequences." Roy Tam Hoi-pong, convenor of the policy concern group, cited latest official figures on tourists to demonstrate the severity of the issue. Last year, Hong Kong's tourist arrivals hit a record high of 65.1 million, with 78 per cent made by mainland visitors. Tam said the figures translated to some 140,000 mainland Chinese tourist arrivals a day, which, even if spread evenly across the city's 18 district, still meant almost 8,000 per district per day. "How do we find space to absorb all these extra people?" Tam said. The groups called on the government to further restrict the number of mainland tourists so one could only visit the city once every six months. The two-hour protest was relatively peaceful, but at one point two more protesters - who the activists said did not belong to any of the groups - turned up and heckled mainland tourists about to board border-crossing buses. The pair held a placard that read "Hong Kong people do not welcome Chinese people" and shouted expletives at the tourist. The anti-mainland tourist sentiment has recently revived in various Hong Kong districts inundated with visitors, such as Tung Chung, Sheung Shui and Kowloon City, prompting the government to look into diverting visitors to other districts. Nancy Chan Nok-yan, a 21-year-old student living in Tuen Mun, said increasingly more businesses mainly catering to mainland visitors had occupied the town's shopping malls and streets, leaving locals struggling to buy what they needed. Chan, who has worked part-timer at a retailer in the past, agreed that the government should control the number of mainland tourists. But, she said requiring one visit every six months was too tough and would hurt the local retail industry. Yu Jianwei, who came to Hong Kong with his wife and son from Beijing, said he understood some Hongkongers felt their lives were affected, but that they should find a solution with the government, instead of venting their anger at mainlanders. "If Hong Kong closes its border [to the mainland], it will starve to death in one day," Yu said. "Where do you get your water and vegetables?" Meanwhile, the Hong Kong Transport Department announced on Sunday that, as part of a nationwide policy, the Hong Kong-Zhuhai-Macao Bridge will be toll-free for small passenger vehicles - seven-seaters or smaller cars - from February 4 to 10. However, the policy will only apply to small passenger vehicles with the licences and permits to use the bridge. For those travelling from Hong Kong to Zhuhai or Macau, they will not be required to pay the toll of 150 yuan.